meeting spot in Nagoya Station. Other meeting spots is here. Nagoya Station, JR Central Towers, was completed on December 20th, 1999. In March 2000, Towers Plaza and Takashimaya department store were opened. 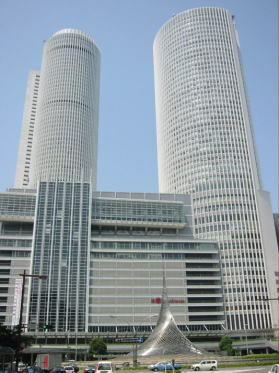 In May 2000, Nagoya Marriott Associa Hotel was opened. Nagoya station area is a good place for shopping or eating delicious foods. When you go out of Nagoya, you will take JR Line, Meitetsu Line or Kintetsu Line from Nagoya. New building will be completed in 2016. There are 3 department stores in this area. Takashimaya, Meitetsu Departmant Store and Matsuzakaya. NANA-chan is the name of the white tall stature in front of Meitetsu Seven building. Nana-chan's birthday is April 28, 1973. She changes her clothing every month. who don't know Nagoya well. rope of Jomon earthware vessels. One of the signature winter events of Nagoya.